I call it the 'Human Laser Harp', and it consists of a person wearing one or two laser gloves, with 5mw green or red lasers, with four lasers on each glove. Along with an array of sensors connected to a wireless or wireless controller unit, a laptop computer and sound system.The 'Laser Harp player' is free to dance and move with their gloves, which are battery powered. they can trigger loops of background tracks, and then over lay those tracks with unlimited selected chords, single notes, different instruments of all sorts, all while triggering stage lighting, video projection and other DMX controllable effects. 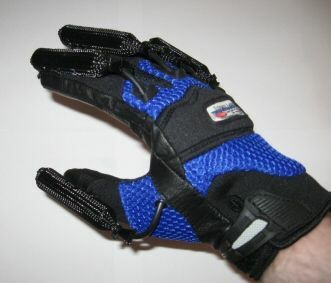 The person wearing these gloves 'plays' music and other sounds or music and video /still image projections as well as stage lighting or any DMX controllable effect, by shining the lasers onto specially mounted photo-optic sensors, that are connected to a wireless or wired controller unit.The wireless controller is faster than Bluetooth, using our own protocol. The controller sends the signals to a laptop computer and out to the sound system. The sensors are connected to the wireless controller via long wires that allow the sensors to be set onto the walls or scattered abut the floor of a performance space, or mounted and any way that can be dreamed up. There can be a large number of sensors, with several/many on each channel, or just exactly the same number as there is channels. The system can be from 8 to 32 channels. Two additional sensors are 'control' sensors, that when shined on can change the programming of all the other sensors to a different pre-programmed selection of sounds and images/videos, in a 'song up', or 'song down' mode.. The software I use can also control any stage lighting, smoke, pyrotechnics, or and other effect that can be controlled via DMX. . The OptiMusic software also allows for the sounds to be modified via the intensity of the light shinning on the sensors, with a higher level of voltage created when the lasers light is close to a sensor, as compared to further away. So pitch or volume of the sound can be varied in this way, via an analog effect. Music! SFX! Images! Videos! Lighting! & more…….! The OMPC1 software receives inputs from up-to 32 sensor units via the USB data communication hardware and is processing pre-programmed events. Channels input: OptiBeams / IR / switches / sonic / Laser / pressure - or any 5V input, can be connected to one computer. The system has a built–in DMX 512 channel virtual mixer - for controlling lighting, stage FX etc.